Monograms are a big deal when you live in the south, and I’m always on the lookout for cute monogram designs that aren’t just your run-of-the mill letters. I love My Capital Letters‘ new patterned designs. Because they love Southern Savers readers so much, My Capital Letters decided that they wanted you guys to share in the launch of their brand’s new Pattern line today! They’ve partnered with designer Francesca Joy to bring patterns and Greek design to their acrylic. 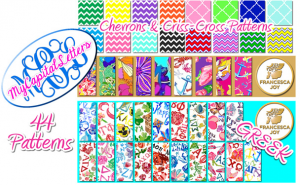 And since we can’t get enough of Chevron, you can find plenty of Chevron patterns for your monograms. If you can’t wait to get your hands on one of these designs, use the code patternparty to get 15% off your order until August 20th. 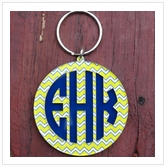 One of my favorite designs is the Monogram Layered Keychain for $34.95. All of these pieces are great for gifts! Especially if you have a bridal shower coming up and you want to get the bride something with her new monogram. We’ll have 4 winners total for this giveaway with the design of your choice – Greek or Non-Greek. You have a couple of chances to enter, so feel free to enter with one or all of the options. 1. Leave a comment below telling me your favorite piece from the new patterened My Capital Letters line. 2. Follow Southern Savers and My Capital Letters on Twitter and tell me you have in a comment below. 3. Like Southern Savers and My Capital Letters on Facebook and leave a comment below telling me you have.